If your mailbox is overloaded with unread and unwanted emails and you don't know where to start – clean up emails with our email inbox cleaner app. Clean Email helps you manage your mailbox – group and organize, remove, label, and archive emails. "You can have Clean Email archive, trash or label emails, and do so with any other messages that match this criterion in the future. It also spots newsletters, and notifications from social networks and project management apps like Slack. I’ve never had an easier time clearing out entire gigabytes’ worth of email until now.."
"Clean Email is a happy medium. The service sifts through your inbox for you, so you can focus on the messages that really matter." "Clean Email is an online bulk email cleaner that uses powerful filters and rules to efficiently segment your mailbox into relevant groups. That means you can read the important stuff you need to get to first and clean up useless emails with a few clicks." "Clean Email looks like a good choice: They don’t have to sell your personal email data because they charge an honest price for their service." 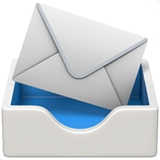 Whether you are trying to clean out your email inbox to achieve Inbox Zero or simply get rid of emails cluttering your mailbox Clean Email is here to help. 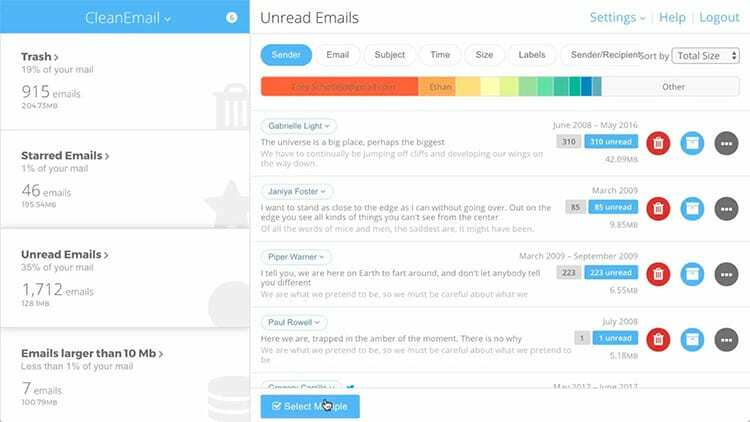 Clean Email organizes all of your emails into easy to review bundles. Remove, archive, move, label (and more!) groups of emails instead of selecting them one by one. Instruct Clean Email to apply selected actions automatically. Set it and forget it! 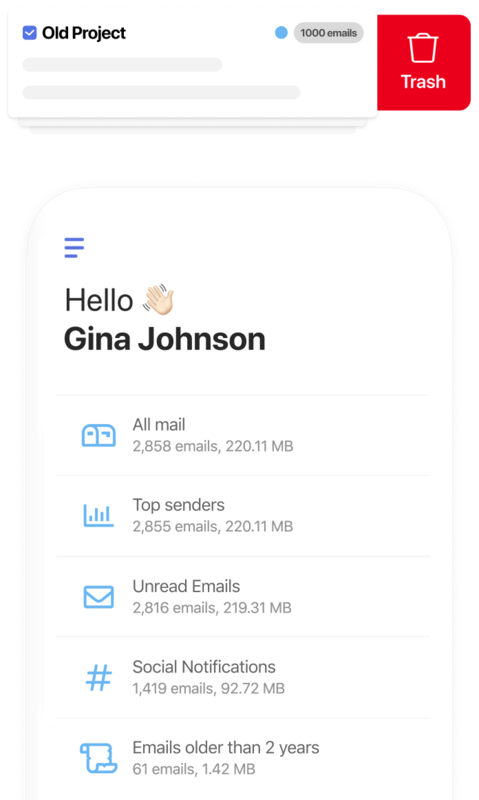 Instead of focusing on individual emails, Clean Email will organize your mailbox into smart views using rules and filters to simplify email management. We make it easy to act on a group of emails allowing you to remove, archive, label them with a few clicks. We make it easy for you to act on a group of emails – whatever you want to do with them. Choose to remove, archive, or label, mark as read or unread, add and remove stars or flag emails – all with a few clicks. Clean Email also allows you to block unwanted senders or unsubscribe from unwanted emails. Use "Smart Unsubscribe" to make sure that newsletters and unwanted subscriptions will not show up in your mailbox. Use "Delete and Block" to make sure that emails which match your selection will never reach your inbox again. Emails matching the rule you selected can be automatically removed, archived, moved, or labeled as they arrive in the future. Clean Email can also send you a summary of all the activity to make sure you never miss anything important. Clean Email never downloads full emails. Our algorithms only analyze email headers that contain subject line, sender and recipient information, dates, email size, and similar metadata. We do not access the content of emails or attachments. After your mailbox is indexed the index will be stored on our servers for 45 days allowing you to use Clean Email to clean and organize your mail. For privacy and security reasons, after 45 days all the indexed data will be removed from our servers and the next time you log in the scan/index process will start over. Mailbox access details are encrypted. They are not available to anyone at Clean Email and they are only used to scan your mailbox and perform selected actions. Gmail uses a protocol called OAuth2 to control access your Gmail mailbox. You "grant" Clean Email access to your mailbox and you can "revoke" it any time. All access tokens are encrypted and only used to perform operations related to our features. Access tokens will never be shared with any third party. iCloud does not support OAuth2 but you can use Apple's "App-specific Passwords" feature for additional layer of security. With App-Specific Passwords you can create a separate password to be used just with Clean Email. It can also be "revoked" at any time. Clean Email is a paid service. We don't sell or keep your data. Clean Email will never share, give away, sell, analyze, "anonymize", or otherwise use your data including but not limited to your email address, email addresses found in your mailbox, email contents, email attachments for any purpose beyond our core functionality. Your access to this website is encrypted with 128 bit encryption provided by Comodo certificate. Click the "Comodo SSL Certificate" logo for more information.